As I mentioned in previous posts, we are using Mystery of History for our history spine this year. I thought that I’d share some of the supplementary resources that I will be using to round out our history studies and to adapt them to my younger kids. I bought a couple of History Pockets at a used currriculum sale and they were so easy to use that now I have almost all of the series. 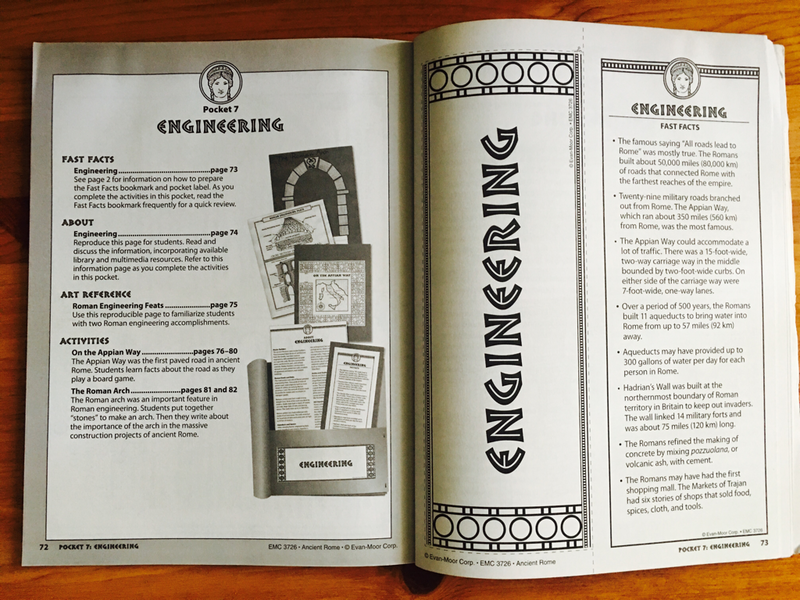 Here’s a sample spread from the book that shows what the pockets look like and what goes in a typical pocket. I don’t actually make the pockets. I usually just glue the activity to colored paper to stick in their binders. This torch from last year’s Ancient Greece unit from History Pockets: Ancient Greece. The bottom part of the torch is a booklet about the history and symbolism of the torch. These are not your usual fluffy cut and paste activities. History Pocket activities actually contribute to kid’s knowledge base. This book is geared for 1st through 3rd graders and it includes units on Mesopotamia, Egypt, Greece, Rome, China, and the Aztecs. Here’s a sample project from the Aztec unit. There’s another page, not pictured that has the pieces to finish the calendar. Here’s an example of a completed project from The Mesopotamia unit we did last year. The ship sails up and down the river. My kids love the interactivity of some of these projects. This is by the same author of Classical Kids and has the same variety of activities, but geared towards the Middle Ages. My middle school aged son is using this for his current cycle of History and is very proud of what a nice looking timeline he has. This book has art projects from around the world and helps fill in some of the gaps. For example, I can’t find an activity book for ancient Australia, but this book has a lesson for Aboriginal art. It also has lessons for African, South American, and Japanese art from the time periods we are studying, too. I just showed you a lot of supplemental activity books, so be sure to read how I organize all of these materials in How I Plan Mystery of History for the Year.